It seems the recording of Malombo Jazz Makers Volume 2 is not available elsewhere. In response to requests and kind comments, we are happy to share this 1971 gem with you. You can buy the CD or digital download containing the hauntingly beautiful song “Sibathatu” from this album on Strut’s important compilation of SA Jazz: "Next Stop Soweto Vol 3". Explore further here and here. This album is a follow-up to the 1967 one and the 1971 "Music of the Spirit" we shared on Electirc Jive earlier and here. All three of these albums are without Philip Thabane and feature Abbey Cindi, Lucky Ranku and Julian Bahula. Philip Thabane split with Cindi and Julian Bahula in 1967 and each went on to form their own versions of Malombo (Jazz Men and Jazz Makers, respectively). 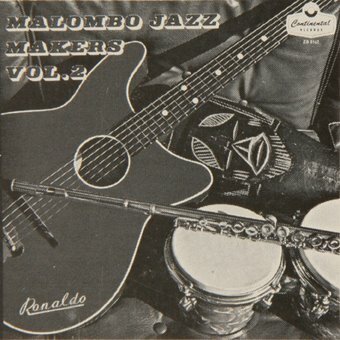 As concerns the Malombo Jazzmen, around the time this "Jazzmakers" album was recorded in 1971, Philip Thabane and Mabi Thobejane did a series of six “Farewell to the USA” shows during May and June in South Africa. They then stopped in at the North Sea Jazz festival in London before making a splash in the U.S.A. from 1972 to 1975, including playing gigs with the likes of Charles Mingus at the Rafike Club in New York; Pharo Sanders at the Philharmonic Hall (NY); Miles Davis (Keystone Corner, San Francisco); Herbie Hancock (Washington DC); Max Roach and Leon Thomas; Stanley Turrentine; McCoy Tyner etc etc - someone somewhere has soundboard recordings of at least some of these concerts? They went on to play the Newport Jazz Festival and tour Japan, before returning home to play at the Mamelodi Stadium on 12th April 1975. A full listing of Philip Thabane’s important gigs can be found in a doctoral thesis, available online. Sello Edwin Galane recently (October 2009) completed a Doctor Musicae Thesis on Philip Thabane and Malombo which was submitted at the University of Pretoria. The thesis: “seeks to investigate the origin and development of the thinking, make up, evolution, meaning, impact, essence of originality, and attempts to reclaim the true identity of African music of South Africa from 1963 to date by Philip Thabane through his concept of Malombo Music. The study introduces Philip Thabane’s biographical background, and sketches out the socio-political milieu in which he has had to do creative work, maps out the stages of development of Malombo music, and investigates how media was bent on shaping a particular public opinion about Malombo music.” The thesis also has interesting pictures and press clippings in the appendices – it can be downloaded here. Also, be sure to check out Matsuli’s Malombo discography here. Thanks again Siemon for the original share. Yes! Thank you so much for this lovely music, especially as it's so extremely rare, and there's no other way to get it. Very grateful. This is the Julian Bahula version of Malombo, rather than the Philip Thabane one, though, is it not? I've now added in this missing recording and linked to your post.